A sunnyish Sunday afternoon in East London last weekend for the Brick Lane Music Festival, with lots of free music across local bars and clubs. On the way we saw Gilbert and George standing on their doorstep, and checked out the magnificent new Rough Trade store. Hundreds of people were sitting outside curry houses in Brick Lane eating their lunch. 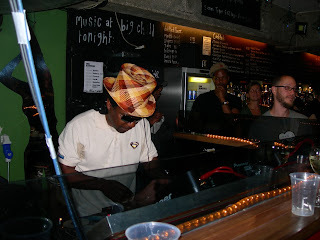 But the main event for us was Norman Jay at the Big Chill Bar. He played a Good Times set of wall to wall anthems, from disco (Lamont Dozier - Back to my Roots, Tavares - Heaven Must be Missing an Angel), acid jazz (Young Disciples - Apparently Nothing), Salsoul (Loleatta Holloway - Runaway), Ska (Specials - Too Much Too Young) and the odd rave classic (Shut Up and Dance - I'm raving, I'm raving). The place was packed with people dancing from one end to the other. Somewhere in an English prison there's an ex-member of the British National Party who planted a bomb in Brick Lane in 1999. He also attacked two of my other hangouts in London: Brixton town centre and Soho, where three people died in the Admiral Duncan - a gay pub in Old Compton Street. His choice of targets -an Asian area, an African-Caribbean area, and a gay area - testified to his vision of a white city purged of racial and sexual difference. No doubt a Jewish area would have been next, if he hadn't been caught. Dancing to Norman Jay was an all ages, straight/gay, multi-racial crowd, in itself a celebration of the real London that some neo-Nazis would love to blast out of existence, but will never succeed in doing.